So if you game very much, it’s likely you have a seasoned hobbyist on your buying list. In that case, Day 4 of our Gift Guide Week is for you: Gamer’s Games. Whether heavily thematic titles of trashy goodness, or more cerebral cube-pushing experiences, these designs are not for the uninitiated. While maybe not all-day affairs with biblical rule books, they are nonetheless more complex and intricate, requiring a greater investment of your time and brainpower. There are about a dozen games I could recommend here. I’m going to cheat and mention a few – Hyperborea is the gamer’s game you should buy for your gamer, but it clocks in at a hefty MSRP of $99 (you can get it for $80 on Amazon). XCOM is my personal top game on my christmas list – but it’s unknown when that game will actually release, and it might arrive too late. Kemble’s Cascade is a blast, but it’s appeal is limited to those with nostolgia over classic arcade space shooters. But it really is a fun game. 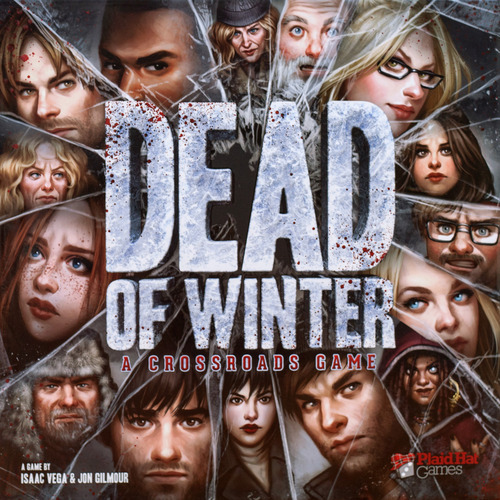 So that leaves me with Dead of Winter, a risky recommendation because I have never actually played the game. But it is the current gamer hotness. It’s all about trying to survive as a team in a post-apocalyptic wasteland (with zombies in the background), but each player has their own personal goals which may or may not be so helpful to everyone else. In fact, there might be a betrayer whose whole point is to screw everyone over. But it’s thematic, rich with storytelling possibilities, and almost everyone who’s played it has loved it. This game is very high on my wish list, and I’d be excited to get it as a gift, which is why I’m recommending it to you. So probably the narrowest target audience of all my recommendations this week, but Star Wars: The Card Game is a wonderful “gamer’s game.” It will appeal to Star Was fans, of course, but also card gamers and fans of collectible card games and deck building games. One of Fantasy Flight’s living card game models, you don’t have to sink tons of money into this one just to be able to compete and have interesting games. But you can. It doesn’t have the same feel as the many collectible card games on which the LCG idea is based, but you still have opportunities to build, customize, and tweak decks. Instead of card-by-card, decks are constructed through “pods” or a small group of cards assigned together. A 2-player game only, Stars Wars: The Card Game is asymmetrical. The Light side must achieve three objectives through attacking the Dark side, while the Dark side may win in a similar fashion, or simply outlast the Light side by keeping them from their missions before a countdown ends. There’s also a unique and interesting secondary “Force” battle to decide initiative each turn which creates new ways to use your cards. Star Wars: The Card Game has plenty of strategy, tons of variability, and lots to explore. More than ideal for “the gamer” on your list. Keyflower is an intuitive masterpiece. At least for the first couple of games. Once you immerse yourself in the game system and understand how everything works together it’s simply a masterpieces. I love games that mix mechanics in an elegant way even if it means that your first game will be a learning experience. I love the moment where things click into place and a game’s depth is suddenly revealed. Last year I was mesmerized by Ginkgopolis and how it combined tile placement, drafting, and tableau building. This year I had the same experience with Keyflower. It mixes worker placement with auctions by presenting your workers as resources that can be used for bidding or placed to activate locations. If that wasn’t enough you’ll have to manage four different colors of workers. But what really makes Keyflower shine is the scoring system. You’ll be gathering resources, tools, and workers throughout the game but those things aren’t worth any points by themselves. You can use them to upgrade buildings in your town but the big points come from tiles that let the owner score one of those categories. If you have a ton of workers but no way to score workers then they’re worth nothing. It’s an incredibly clever system and one that forces players to adapt to what’s available in each game. Who to buy it for: Game mechanic lovers, especially worker placement and auction. Who not to buy it for: People who like to really understand a game during their first play. If you are looking for a game to crush your soul and make you miserable, in a good way, then look no further than Robinson Crusoe. It is dripping with so much theme that you feel as though you are stranded on a deserted island and are fighting for your very survival. Every decision you make is critical to the outcome of the game, and it forces you to make some tough choices regarding your options as it is impossible to do them all. Sacrifices must be made to ensure that you make it off that island in…relatively…one piece. The base mechanic of the game is worker placement, but the gameplay also involves some dice rolling and random card draws. I find that this blends seamlessly with the theme of the game as it reinforces the overall survival experience. You have your carefully laid out plans to make it through the night somewhat unharmed, but a freak storm, or an unexpected animal attack can make them all come crashing down around you. The rule book takes a bit to comprehend as it isn’t written all that well, but once you get the general idea, the game becomes very intuitive. It definitely isn’t for someone new to games, as you will probably have to play a few times before you actually pull off a victory! Who to buy it for: Anyone who wants a thematic worker placement game, or who wants a challenging co-operative or solo game. Who not to buy it for: Non or new gamers, or anyone who doesn’t like the added random factor to their worker placement games. Anyone who doesn’t want to spend 2+ hours on a game. Okay, this one’s got a pretty heavy ruleset, lots of things to manage, and easily suits the heavier gamers in the world. But what it does differently from a lot of heavy games is this: It makes learning the game fun and relatable. Who can’t relate to taking care of pets, getting them ready to show, cleaning out cages, and dealing with lots of pet poop? The rules are humorous with lots of little jokes thrown in, making even nervous newbies want to stick with it to learn this game. The game itself is charming and, though long, the humor and theme means it never feels like it’s just a slog through some medieval farmer’s field. It makes a great “My First Heavy Game” gift because it has all the trappings of a brain burning euro, wrapped up in a cute, funny, fuzzy package. Who to buy it for: Serious gamers who like a little humor in their games and light to mid-weight gamers who are ready to move up in complexity. Who not to buy it for: Gamers with an aversion to poop jokes and those who aren’t ready for heavy games. Cute as it is, it’s still pretty hefty.